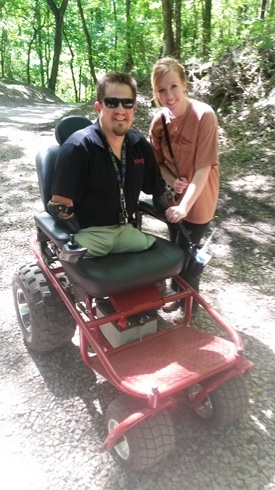 Recently, I was asked to test out a power chair at the Red Mountain Park in Hoover, Alabama. At first I was very reluctant because I know that going through mountain trials and dirt roads would not be very fun in my manual chair. So, I simply avoid them all together. However, I was introduced to a power device that changed my view. Literally! I was asked to try out a device called the Nomad. The Nomad is a big power chair with big wheels and a joy stick. Once I transferred into the device I had to test out the joy stick to make sure that I could change directions and speed up without losing control. All of that is easy when on smooth concrete but when on a rocky, dirt, hill path it could be a different story. I will admit that I had a little trepidation. Which is why I typically stay away from anything power machined since I only trust my own arms to power my manual chair. Plus, I still believe that the best exercise for a person that uses a wheelchair is to use the manual chair. Swimming, hand-cycles, and track chairs are good workouts as well but I do prefer to push my rugby chair. I stay away from power chairs as a fear of not getting enough exercise. As I was using the Nomad, I did not have any issues. I did like the 6 mph of power, I did like the ability to climb a dirt hill, and I did love going through small rocky pathways. It did provide me with the opportunity to do something I have never done on my own. I have lived 17 years in Alabama and I have been a person with a physical disability for 35 year, but on May 12, 2015 I got to take a power stroll through Red Mountain Park. It was quite a historical and fun-filled experience. At the end of the day, I have had my perspective changed, slightly. Yes, I still do not like power chairs for everyday use, especially if you can push your own manual chair, but I do embrace and see the benefits of modern assistive technology to provide a recreation/leisure experience of going to a place I have never been before. Now, I do see benefits for being able to explore national parks and beaches. That is if you like going to the beach. For myself, since I do live 10 minutes from Red Mountain Park, I do plan to power my way to view parts of this area that I would not have otherwise. Embrace the outdoors, literally. Are you an outdoors person? How do you navigate the pathways? Should I Exercise Outdoors? And Can I?